Callum Hudson-Odoi has been told to think carefully before quitting Chelsea this summer, in the wake of reported transfer interest from Manchester United and Liverpool. Hudson-Odoi, 18, became England’s youngest competitive debutant in Friday’s 5-0 thumping of the Czech Republic, eclipsing Duncan Edwards’ record set in 1955, and made his full debut in Podgorica against Montenegro on Monday night. You can see how he, and his England teammates, performed in our Player Ratings, here. But his club future remains very much under the spotlight, and with just 15 months left on his contract and seemingly not wishing to extend his deal, Chelsea could be forced to cash in on a player this summer. Hudson-Odoi was the subject of strong interest from Bayern Munich in January, while both Liverpool and Manchester United are reported to be considering summer swoops for the talented teenager. That said, Chelsea’s stance on selling the player to a rival Premier League side has been made pretty clear. Part of Hudson-Odoi’s thinking this summer will be the amount of game-time he will be granted at both Chelsea next season or any new club – and the player has recently addressed concerns he is not featuring enough for the Blues. And with that in mind, Southgate has advised the young winger to choose his next move extremely carefully. “And I know from when we were talking with the club earlier in the season how much faith Maurizio [Sarri] has in him. He has got some outstanding players just in front of him but he’s slowly getting more and more game time. 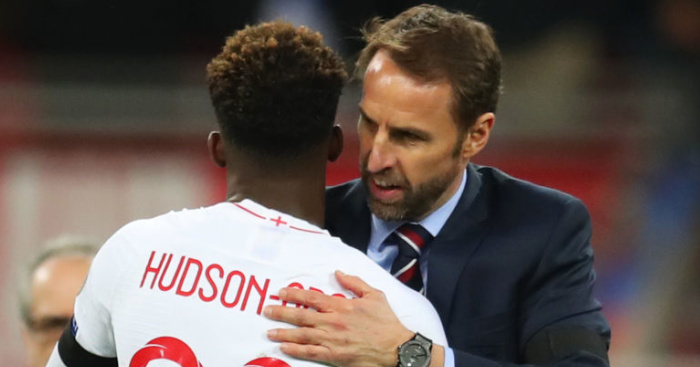 The post Southgate advises Hudson-Odoi over Man Utd, Liverpool rumours appeared first on teamtalk.com.